Time goes in one direction: forward. Little boys become old men but not vice versa; teacups shatter but never spontaneously reassemble. This cruel and immutable property of the universe, called the "arrow of time," is fundamentally a consequence of the second law of thermodynamics, which dictates that systems will always tend to become more disordered over time. But recently, researchers from the U.S. and Russia have bent that arrow just a bit — at least for subatomic particles. At the subatomic scale, where the odd rules of quantum mechanics hold sway, physicists describe the state of systems through a mathematical construct called a wave function. This function is an expression of all the possible states the system could be in — even, in the case of a particle, all the possible locations it could be in — and the probability of the system being in any of those states at any given time. Generally, as time passes, wave functions spread out; a particle's possible location can be farther away if you wait an hour than if you wait 5 minutes. Undoing the spreading of the wave function is like trying to put spilled milk back in the bottle. But that's exactly what the researchers accomplished in this new experiment. "There is basically no chance of this happening on its own," lead researcher Valerii Vinokur, a physicist at Argonne National Laboratory in Illinois, told Live Science. "It is like that saying, where if you give a monkey a typewriter and a lot of time, he may write Shakespeare." In other words, it's technically possible but so unlikely it may as well be impossible. "You really need a lot of control to make all the broken pieces of a teacup come back together," Stephen Bartlett, professor of physics at the University of Sydney, told Live Science. Bartlett was not involved in the study. "You have to have a lot of control over the system in order to make it do that … and a quantum computer is something that lets us have a huge amount of control over a simulated quantum system." 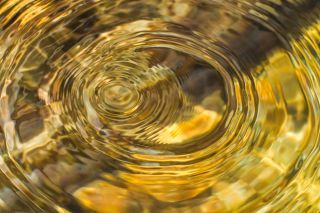 "It is very complex and complicated to send waves on a pond back" once they've been created, Vinokur said, "but we saw that this was possible in the quantum world, in a very simple case." In other words, it was possible when they used the control given to them by the quantum computer to undo time's effect. After running the program, the system went back to its original state 85 percent of the time. However, when a third qubit was introduced, the experiment succeeded only 50 percent of the time. The researchers said the complexity of the system likely increased too much with the third qubit, making it harder for the quantum computer to maintain control over all aspects of the system. Without that control, entropy can't be held in check, and the time reversal is therefore imperfect. Still, they're aiming for bigger systems and bigger quantum computers for their next steps, Vinokur told Live Science. "The work is a nice contribution to the foundations of physics," James Whitfield, a professor of physics at Dartmouth College in New Hampshire, who was not involved in the study, told Live Science. "It reminds us that not all applications of quantum computing must be application-oriented to be interesting." "This is exactly why we're building quantum computers," said Bartlett. "This is a demonstration that quantum computers can allow us to simulate things that should not occur in the real world."